FP parallel resistance constant watt heating cables are designed to provide freeze protection or process temperature maintenance to piping, tanks and equipment. The parallel resistance configuration allows the cable to be cut to length and terminated in the field with easy-to-use Thermon supplied kits. 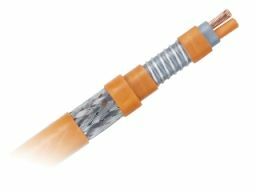 FP cables provide consistent and reliable heat outputs regardless of circuit length. Because FP cables are not subject to the inrush current associated with self-regulating heating cables, the need for oversizing power distribution equipment is eliminated.